Pre-workoutOlimp Amok - 60 kaps. Supplement with the latest line of sports martial arts dedicated to modern warriors, enabling turn the tide for your site. Designed specifically for strength-endurance disciplines. AMOK ™: Probably again a hard day at work? Do not you want to move, and you know that the mates on the training you do not forgive. Exactly! They will be rested and eager for victory. They have to survive on someone, and the person without inspiration to training is a very good goal. Do not be surprised everyone wants to be the BEST! They plunge you how in the end not mobilize yourself. You need to get their act together, to act precisely and finally sweep company. No more feeling sorry: it is hard that you do not want that others have it easier. Maybe so, but it's time to smash them with thoughts of victory. AMOK ™ HELPS YOU IMMEDIATELY to mobilize! Know the Strength! In order to get this particular tool? AMOK ™. It is a real killer, created precisely in order to give extremely high motivation and strength, you fall into a wild rage and feel bursting energy wave rolling across your body after ingestion, for the duration of the training. 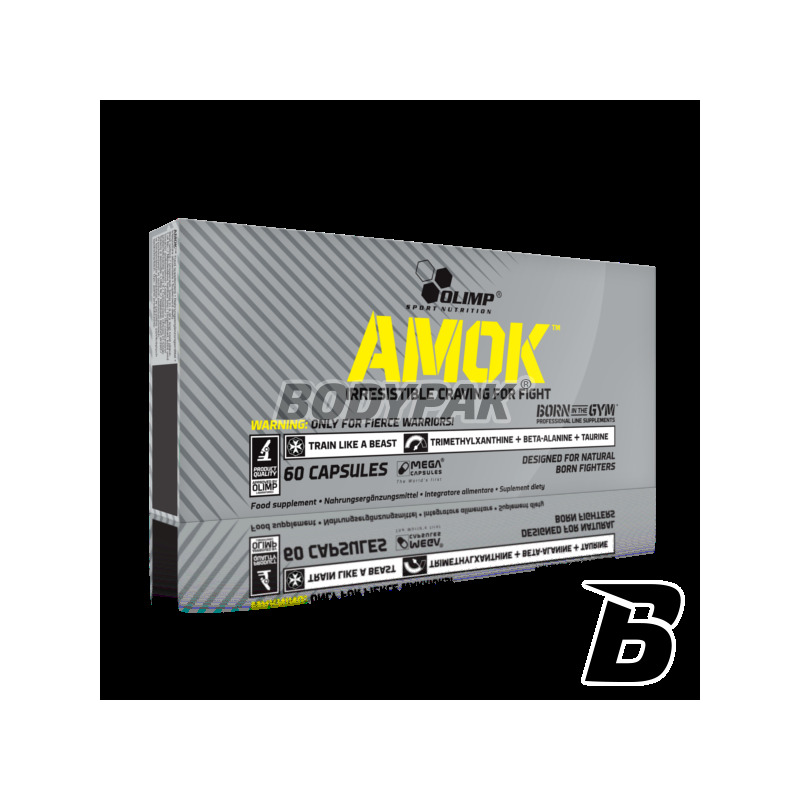 AMOK ™ is a unique composition of carefully selected amounts of beta-alanine, L-tyrosine and taurine, supplemented by a tear portion of 1,3,7-trimethylxanthines and extract of ginseng. Olimp Amok can turn the tide for your site, if you think the fight is your whole life - Olimp Live & Fight® is created just for you! Now you have the chance to crush all your opponents! Line supplements Olimp Live & Fight® is dedicated to the modern gladiators, warriors steeped in the worship of each of the martial arts combat, improvement of professional and amateur their skills in everyday katorżniczych training or sparring. Products with this elite line are designed for accelerating the progress of training both through increased post-exercise recovery, and enhance the ability of the body to extreme effort. Olimp Amok was created and has been tested in cooperation with professional players martial arts. The result of painstaking experiments products are perfectly tailored to the needs of people practicing these demanding sports, who dedicate themselves to them endlessly through the blood, striving to win. Moim zdaniem 3x tak, polecam. Kopie dobrze i nie pompuje, dlatego sprawdza się na długie sesje sparingowe, polecam. Dobry i tani produkt dla fighterów, skuteczny w działaniu! Zdecydowanie przedłuża możliwości treningowe podczas sparingów. Świetnie sprawdza się w ringu. Duży plus również za niewielką cenę!